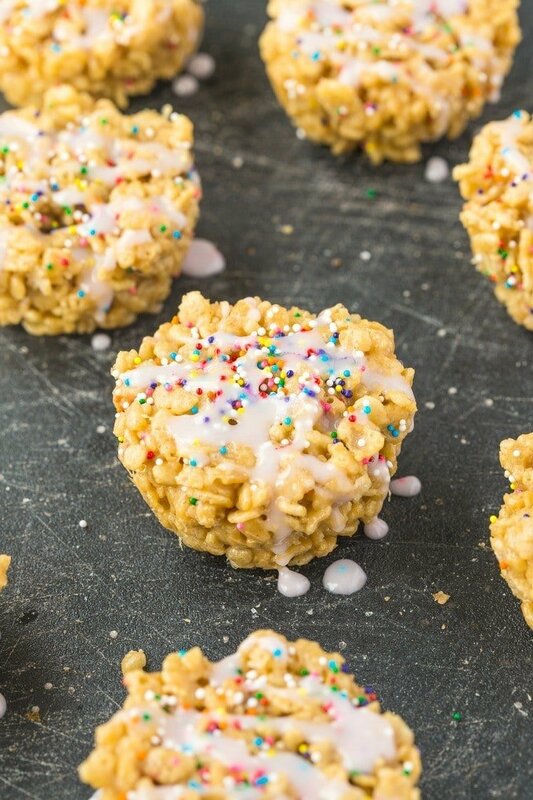 Just four easy ingredients are needed to make these healthy cake batter rice crispy treats which are packed with protein! Unlike traditional versions, this one has no butter, oil, marshmallows or added sugars AND requires no baking- It’s gluten free and vegan too! Female- Salads, frozen yogurt and a single square of dark chocolate (90% plus or else!). Male- Steak, potatoes and a block of chocolate (milk, or else!). Female- Cupcakes, muffins and blondies. Male- Pie, pudding and the entire cake. Female- Sprinkles, funfetti and powdered sugar. I think subconsciously, many of us play into the stereotype too. These thoughts often cross my mind whenever I’m playing around in the kitchen. However, I think it’s important to stay true to your own thoughts, ideas and run with them. When I look at the above list, I actually could easily fit into either gender stereotype very easily. While I prefer steak and potatoes over salad, I would kill a tray of blondies or muffins over pudding. As for cilantro, I would name my worst enemy that. Seriously, cilantro is worse than edible punishment (if that could be a thing). Regardless of whether or not you fall into either stereotype, it’s important to ensure you’re falling into them because YOU want to and not because society or the media dictates it to be acceptable. I’ll eat my steak dinner and end with a single vanilla cupcake laced in sprinkles and call it day. 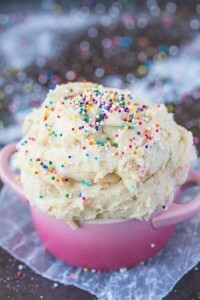 It’s no secret that I seem to be on a funfetti/sprinkles trend right now. 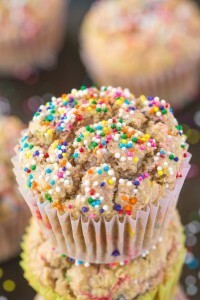 I loved using them in this vanilla cake, these no bake bites and these muffins. They also got the pampering in this single serve dip. Oh and we can’t forget the low carb cake batter spread which pimped up my sandwiches, like a BOSS! I’ll also let you in on another secret…It’s not going to stop. I still have two in my archives to share in the coming week so build a bridge and get over it. I didn’t think it was possible to be able to top my original 3 ingredient rice crispy treats but being someone to loves adding protein powder to anything and everything, this obviously had to happen too. I have done a chocolate version of this (stay tuned for yet another chocolate twist….it’s too good!) but went back to my tried and tested original with some pimping up. The simple addition of vanilla protein powder IN the actual bars AND used as part of the glaze = You need to do it. 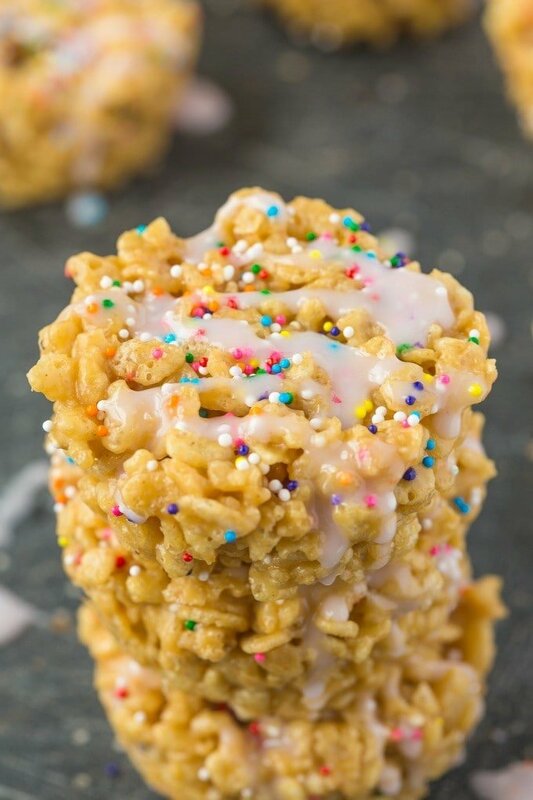 These healthy four ingredient cake batter rice crispy treats are the healthier version of the childhood classic. It’s been given a welcomed makeover which, dare I say, could give it a run for its money? Unlike traditional rice crispy treats which use butter, marshmallow and often oil to keep it intact, these have none of them whatsoever. I used my original three ingredient rice crispy base but added a scoop of protein powder in the base (and changed some of the ratios to make it easier to mold) and also made an optional glaze on the top which gave it a cake batter like flavor! These literally take five minutes to make and have no refined sugar in them. they are also suitable for those following a gluten free and vegan lifestyle! HACK! Notice the shape? For perfectly portioned rice crispy treats, use a muffin tin to firm up! These make them so much easier to freeze for quick, random snacking AND are so much easier for putting in your pockets when you run out the door at 9am to buy chocolate chips and are starving. 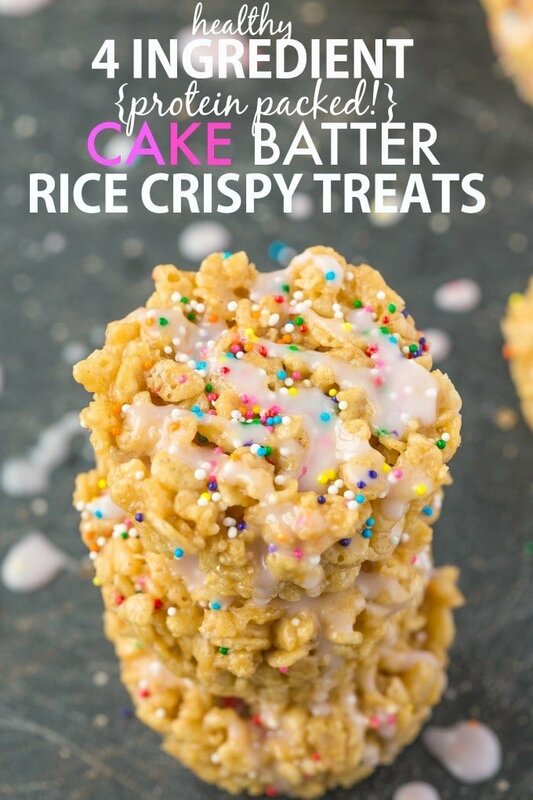 Make these healthy four ingredient cake batter rice crispy treats (with a protein punch) and whether you like sprinkles or steak or even that terrible herb called Cilantro- At the end of the day, it’s FOOD. (Except for the granola I made named Sandy. Those who follow me on Snapchat saw how THAT story unfolded). 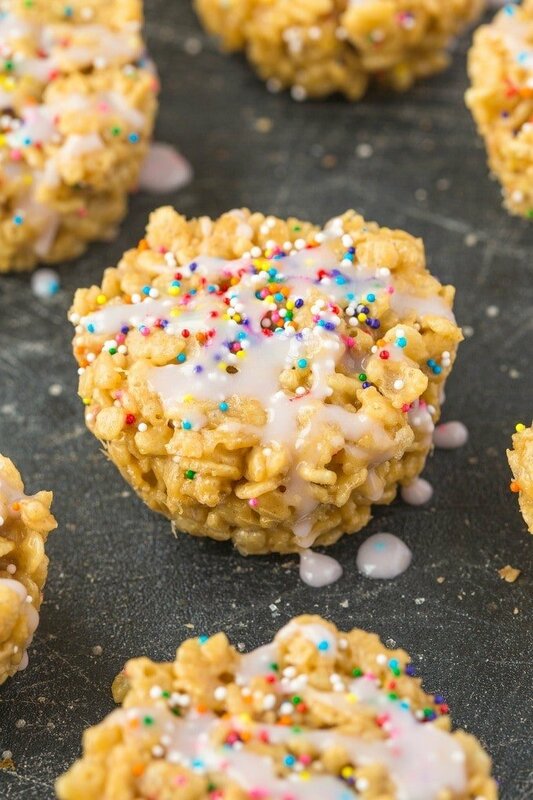 Just four easy ingredients are needed to make these healthy cake batter rice crispy treats which are packed with protein! Unlike traditional versions, this one has no butter, oil, marshmallows or added sugars AND requires no baking- It's gluten free and vegan too! Line a baking tray with baking paper or a muffin tin and set aside. Stovetop or in the microwave, melt your nut butter with your sticky sweetener and mix well. Add the protein powder and continue stirring until fully incorporated. If you used brown rice syrup, this should be perfect. If you used honey or maple, you may need to add a dash more to make them stick together. Pour the mixture over the rice crispy cereal and add sprinkles and mix very well. Pour mixture into the lined baking tray and press firmly into place or fill muffin cups to the top. Set aside Refrigerate for at least 30 minutes to firm up. While it's firming up, prepare your glaze by combining all the ingredients together and thinning out with liquid until a thick, spreadable batter is formed. Top your rice crispy treats with them and refrigerate for another 30 minutes, or until firm. * Depending on the protein powder you use, you may need another T of either nut butter or sticky sweetener to firm up. When I used a vegan brown rice protein powder, it was slightly clumpy but held VERY well (as pictured). When I used whey, it was terrible and really difficult to form (except for the glaze). 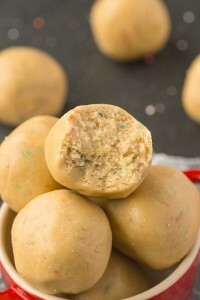 These are freezer friendly but can be kept at room temperature. Want some manly sprinkles? Coming at you….manly style. Does your food choices subconsciously mould into your gender’s stereotype? You know I never thought about the gender factor with food but now that you mention I can imagine you must get flack for it. Stay true to who you are! Your readers love you for that! I noticed early on that Adam and I seem to be reverses in our food gender stereotypes! Let’s just say he’s super into froyo and anything with sprinkles on it he has already eaten 🙂 And he’s still confused by how much sausage I eat! Just tell them that sprinkles are for winners. If they don’t like the sprinkles, then they obviously aren’t a winner. And only winners here, please. I always add sprinkles. Did you just say cilantro was edible punishment?!! No, no, no, NO! Cilantro is a staple in my house. If I run out, I don’t know what to do. LOL Ok I will say I am not really a sprinkle person. But they definitely make things prettier. And my boys love sprinkles, I don’t think my daughter does. So there goes that stereotype too. Anyway, I do love your healthy desserts…sprinkles or no sprinkles! hahaha you and cilantro and pickles. I know what to send you! You have me pegged! Hehe. But I know what to send you too! So if this was true I’d be a man to the core. Not so surprising. And pudding over cupcakes anytime. In fact I have a theory about cupcakes! If baked goods went to high school cupcakes would be the plastics. Think about it. You had me at cake! A good thing to have you at! I eat everything put in front of my face. Except seafood (blech!). And I say go for pudding filled cupcakes. Why choose? These treats look mighty tasty. need to make these! I love Skoop vanilla combined with peanut butter which will go perfect for these krispy treats. Oh the ol’ food gender stereotypes. Don’t forget quiche. Quiche is definitely lady food. You could make it man food since it’s just eggs and stuff, but you’d have to call it “breakfast pie” instead. WHAT. I want a quiche now but I’ll call it….fat egg. Looove the commentary on food gender stereotypes. Keep making whatever you want! Haha I didn’t know that certain foods were only for certain genders. I am happy to eat a giant steak OR these krispy treats. Silly people. Right? or you know, mac and cheese pizza. Cilantro hater!! Jeez Arman, why you gotta be like that?! ? hahaha no!!!! It’s so bad! Ha! This reminds me of two things: 1. An embarrassing nickname I aquired by a friend due to a serious pudding phase I went through [so apparently that makes me male? My collection of nail polish tells a different story …]. 2.Said friend telling me how she and her boyfriend ate a restaurant, one ordering salad, the other a burger. When served she was given the salad – yet that had actually been her boy’s order. Stereotyping everywhere you look. Ironically, I’m craving pudding now! WHAT? You like it? Oh noooooo. Build a bridge and get over it….love it that’s going straight in my basket! Ah the eating stereotypes… Sigh…. I hate when people order what they think they should rather than what they want… I have honestly had people say to me ‘oh I wish I had the courage to order a steak’ and ‘gosh you eat a lot of meat for a girl’… Boo! Or the worst is when david and I order food and when the server brings it over they always presume the ‘lighter’ dish is for me! Bugger off that beef is all mine!! Haha! Yea I literally just ate like 6 servings of cilantro, no joke. I love the stuff, it feels like a Spanish party in my mouth. These treats look like they would also have a party in my mouth. I’ll draw the mouth party line there. Sprinkles are adorable! I see no reason why they should be reserved only for women. Making these treats in a muffin tin is such a great idea. My rice krispie treats are always impossible to cut. Hi Arman, I found your website by looking for recipes that I could use for trail food. As a hiker, having something that’s quick and easy (and tasty!) is a key element when you’re constantly on the move. The toughest part of this is going to be choosing which one(s) to try first! I look forward to seeing and trying more of your recipes! Thanks SO much Eric- That means a ton! Are chocolate sprinkles more masculine? 😉 I don’t think I’ve ever really bothered to pay attention to gender food stereotyping, but I can totally see how it exists. You do you, boo! Cilantro is a gift from the gods, although I certainly wouldn’t turn down sprinkles either. Eat what you like, screw the stereotypes. Oh yum- Double the peanut buttery goodness- Love it! OMG. Cilantro IS the devil!!!! !